"DC-10" redirects here. For other uses, see DC10 (disambiguation). The McDonnell Douglas DC-10 is an American three-engine wide-body jet airliner manufactured by McDonnell Douglas. It has two turbofan engines mounted on underwing pylons and a third engine at the base of the vertical stabilizer. The DC-10 was intended as a successor to the company's DC-8 for medium- to long range flights, using a larger capacity wide-body layout with seating up to 380 and more powerful engines. Lockheed also saw this niche as an ideal place to reenter the commercial airliner market with their very similar L-1011 TriStar. Although the L-1011 was more technologically advanced, the DC-10 would go on to outsell the L-1011 by a significant margin due to the DC-10's lower price and earlier entry into the market. The initial DC-10-10 model was a "domestic" design with a typical range on the order of 3,800 miles (6,100 km) in a two-class layout. The -15 was a "hot and high" version with more powerful engines. The -30 and -40 models were the "international" versions with extended range of up to 6,220 miles (10,010 km) and a third main landing gear leg to support the higher takeoff weights. An even longer-range version proposed for British Airways, the -50, was not built. The KC-10 Extender air-to-air refueling tanker version, was based on the -30 model. Production of the DC-10 ended in 1989, with 386 DC-10s delivered to airlines and 60 KC-10s to the U.S. Air Force. The DC-10 had a poor safety record in early operations, especially due to a design flaw in the cargo doors. Its safety reputation was further damaged by the crash of American Airlines Flight 191, which remains the deadliest aviation accident in the United States. Following the Chicago crash, the FAA withdrew the DC-10's type certificate in June 1979, which temporarily grounded all U.S. DC-10s. In August 1983, McDonnell Douglas announced that it would end production of the DC-10, citing a lack of orders. Airline industry consensus at the time was that the DC-10 had a poor reputation for fuel economy and for its overall safety. In spite of the DC-10's early difficulties, it ultimately accumulated a good safety record, as design flaws were rectified and fleet hours increased, comparable to similar second-generation passenger jets as of 2008. The DC-10 was succeeded by the McDonnell Douglas MD-11, essentially an enlarged version of the DC-10 with some design improvements. Boeing, which merged with McDonnell Douglas in 1997, conducted an upgrade program that equipped many in-service DC-10s with a glass cockpit that eliminated the flight engineer position; the upgraded aircraft were re-designated as MD-10s. The DC-10's last commercial passenger flight took place in February 2014, although freighter versions continue to operate. The largest operator of the DC-10 is U.S. cargo airline FedEx Express. Despite the airliner's popularity, only a few DC-10s are on display, while other retired aircraft are in storage. DC-10s are also used for specialist services, such as the Orbis International Flying Eye Hospital, which has a compartment for performing eye surgery. Following an unsuccessful proposal for the U.S. Air Force's CX-HLS (Heavy Logistics System) in 1965, Douglas Aircraft began design studies based on its CX-HLS design. In 1966, American Airlines offered a specification to manufacturers for a widebody aircraft smaller than the Boeing 747 but capable of flying similar long-range routes from airports with shorter runways. The DC-10 became McDonnell Douglas's first commercial airliner after the merger between McDonnell Aircraft Corporation and Douglas Aircraft Company in 1967. An early DC-10 design proposal was for a four-engine double-deck wide-body jet airliner with a maximum seating capacity of 550 passengers similar in length of a DC-8. The proposal was shelved in favor of a trijet single-deck wide-body airliner with a maximum seating capacity of 399 passengers, and similar in length to the DC-8 Super 60. On February 19, 1968, in what was supposed to be a knockout blow to the competing Lockheed L-1011, George A. Spater, President of American Airlines, and James S. McDonnell of McDonnell Douglas announced American Airlines' intention to acquire the DC-10. This was a shock to Lockheed and there was general agreement within the U.S. aviation industry that American Airlines had left its competitors at the starting gate. Together with American Airlines' decision to announce the DC-10 order, it was also reported that American Airlines had declared its intention to have the British Rolls-Royce RB211 turbofan engine on its DC-10 aircraft. The DC-10 was first ordered by launch customers American Airlines with 25 orders, and United Airlines with 30 orders and 30 options in 1968. The first DC-10, a series 10, made its maiden flight on August 29, 1970. Following a test program with 929 flights covering 1,551 hours, the DC-10 received its type certificate from the FAA on July 29, 1971. It entered commercial service with American Airlines on August 5, 1971 on a round trip flight between Los Angeles and Chicago. United Airlines began DC-10 service on August 16, 1971. American's DC-10s had 206 seats and United's had 222; both had six-across seating in first-class and eight-across (four pairs) in coach. The DC-10's similarity to the Lockheed L-1011 in design, passenger capacity, and launch date resulted in a sales competition that affected profitability of the aircraft. The series 30 and 40 were the longer-range "international" versions. The main visible difference between the models is that the series 10 has three sets of landing gear (one front and two main) while the series 30 and 40 have an additional centerline main gear. The center main two-wheel landing gear (which extends from the center of the fuselage) was added to distribute the extra weight and for additional braking. The series 30 had a typical load range of 6,220 mi (10,010 km) and a maximum payload range of 4,604 mi (7,410 km). The series 40 had a typical load range of 5,750 miles (9,265 km) and a maximum payload range of 4,030 miles (3,500 nmi, 6,490 km). The DC-10 had two engine options and introduced longer-range variants a few years after entering service; these allowed it to distinguish itself from its main competitor, the L-1011. The 446th and final DC-10 rolled off the Long Beach, California Products Division production line in December 1988 and was delivered to Nigeria Airways in July 1989. The production run exceeded the 1971 estimate of 438 deliveries needed to break even on the project. As the final DC-10s were delivered McDonnell Douglas had started production of its successor, the MD-11. In the late 1980s, as international travel was growing due to lower oil prices and more economic freedom, widebody demand could not be met by the delayed Boeing 747-400, MD-11 and the Airbus A330/A340 while the B747-200/300 and DC-10 production ended, and the used DC10-30s value nearly doubled from less than $20 million to nearly $40 million. The DC-10 is a low-wing cantilever monoplane, powered by three turbofan engines. Two engines are mounted on pylons that attach to the bottom of the wings, while the third engine is encased in a protective banjo-shaped structure that is mounted on the top of the rear fuselage. The vertical stabilizer with its two-segment rudder, is mounted on top of the tail engine banjo. The horizontal stabilizer with its four-segment elevator is attached to the sides of the rear fuselage in the conventional manner. The airliner has a retractable tricycle landing gear. To enable higher gross weights, the later -30 and -40 series have an additional two-wheel main landing gear, which retracts into the center of the fuselage. It was designed for medium to long-range flights that can accommodate 250 to 380 passengers, and is operated by a cockpit flight crew of three. The fuselage has underfloor storage for cargo and baggage. The DC-10-10 is the initial passenger version introduced in 1971, produced from 1970 to 1981. The DC-10-10 was equipped with GE CF6-6 engines, which was the first civil engine version from the CF6 family. A total of 122 were built. The -10CF is a convertible passenger and cargo transport version of the -10. Eight were built for Continental Airlines and one for United Airlines. The -15 variant was designed for use at hot and high airports. The series 15 is basically a -10 fitted with higher-thrust GE CF6-50C2F (derated DC-10-30 engines) powerplants. The -15 was first ordered in 1979 by Mexicana and Aeroméxico. Seven were completed between 1981 and 1983. FedEx became the first U.S. carrier to equip its aircraft with an anti-missile defense system in 2006. The gray oval Northrop Grumman Guardian pod can be seen on the belly of this FedEx MD-10 between and just aft of the main landing gear. A proposed version of the DC-10-10 with extra fuel tanks, 3-ft (0.9 m) extensions on each wingtip and a rear center landing gear. It was to use Pratt & Whitney JT9D-15 turbofan engines, each producing 45,500 lbf (203 kN) of thrust, with a maximum takeoff weight of 530,000 lb (240,400 kg). But engine improvements led to increased thrust and increased takeoff weight. Northwest Orient Airlines, one of the launch customers for this longer-range DC-10 requested the name change to DC-10-40. A long-range model and the most common model produced. It was built with General Electric CF6-50 turbofan engines and larger fuel tanks to increase range and fuel efficiency, as well as a set of rear center landing gear to support the increased weight. It was very popular with European flag carriers. A total of 163 were built from 1972 to 1988 and delivered to 38 different customers. The model was first delivered to KLM and Swissair on November 21, 1972 and first introduced in service on December 15, 1972 by the latter. The convertible cargo/passenger transport version of the -30. The first deliveries were to Overseas National Airways and Trans International Airlines in 1973. A total of 27 were built. The extended-range version of the -30. The -30ER aircraft has a higher maximum takeoff weight of 590,000 lb (267,600 kg), is powered by three GE CF6-50C2B engines each producing 54,000 lbf (240 kN) of thrust and is equipped with an additional fuel tank in the rear cargo hold. It has an additional 700 mi of range to 6,600 mi (5,730 nmi, 10,620 km). The first of this variant was delivered to Finnair in 1981. A total of six were built and five -30s were later converted to -30ERs. Also known as the DC-10-30F. This was the all freight version of the -30. Production was to start in 1979, but Alitalia did not confirm its order then. Production began in May 1984 after the first aircraft order from FedEx. A total of 10 were built. The first long-range version fitted with Pratt & Whitney JT9D engines. Originally designated DC-10-20, this model was renamed DC-10-40 after a special request from Northwest Orient Airlines as the aircraft was much improved compared to its original design, with a higher MTOW (on par with the Series 30) and more powerful engines. The airline's president wanted to advertise he had the latest version. The company also wanted its aircraft to be equipped with the same engines as its Boeing 747s for fleet commonality. Northwest Orient Airlines and Japan Airlines were the only airlines to order the Series 40 with 22 and 20 aircraft, respectively. Engine improvements led to the DC-10-40s delivered to Northwest featuring Pratt & Whitney JT9D-20 engines producing 50,000 lbf (222 kN) of thrust and a MTOW of 555,000 lb (251,815 kg). The -40s for Japan Airlines were equipped with P&W JT9D-59A engines that produced a thrust of 53,000 lbf (235.8 kN) and a MTOW of 565,000 lb (256,350 kg). 42 were built from 1973 to 1983. Externally, the DC-10-40 can be distinguished from the -30 series by a slight bulge near the front of the nacelle for the #2 (tail) engine. A proposed version with Rolls-Royce RB211-524 engines for British Airways. The order never came and the plans for the DC-10-50 were abandoned after British Airways ordered the Lockheed L-1011-500 instead. Two-engine designs were studied for the DC-10 before the design settled on the three-engine configuration. Later a shortened DC-10 version with two engines was proposed against the Airbus A300. The KC-10 Extender is a military version of the DC-10-30CF for aerial refueling. The aircraft was ordered by the U.S. Air Force and delivered from 1981 to 1988. A total of 60 were built. The KDC-10 is an aerial refueling tanker for the Royal Netherlands Air Force. These were converted from civil airliners (DC-10-30CF) to a similar standard as the KC-10. Also, commercial refueling companies Omega Aerial Refueling Services and Global Airtanker Service operate two KDC-10 tankers for lease. Four have been built. The DC-10 Air Tanker is a DC-10-based firefighting tanker aircraft, using modified water tanks from Erickson Air-Crane. The MD-10 is retrofit cockpit upgrade to the DC-10 and a re-designation to MD-10. The upgrade included an Advanced Common Flightdeck (ACF) used on the MD-11 and was launched in 1996. The new cockpit eliminated the need for the flight engineer position and allowed common type rating with the MD-11. This allows companies such as FedEx Express, which operate both the MD-10 and MD-11, to have a common pilot pool for both aircraft. The MD-10 conversion now falls under the Boeing Converted Freighter program where Boeing's international affiliate companies perform the conversions. In July 2018, there were 39 DC-10s and MD-10s in airline service with operators FedEx Express (36), Kelowna Flightcraft Air Charter (2), and TAB Airlines (1). On January 8, 2007, Northwest Airlines retired its last remaining DC-10 from scheduled passenger service, thus ending the aircraft's operations with major airlines. Regarding the retirement of Northwest's DC-10 fleet, Wade Blaufuss, spokesman for the Northwest chapter of the Air Line Pilots Association said, "The DC-10 is a reliable airplane, fun to fly, roomy and quiet, kind of like flying an old Cadillac Fleetwood. We're sad to see an old friend go." Biman Bangladesh Airlines was the last commercial carrier to operate the DC-10 in passenger service. The airline flew the DC-10 on a regular passenger flight for the last time on February 20, 2014, from Dhaka, Bangladesh to Birmingham, UK. Local charter flights were flown in the UK until February 24, 2014. Non-airline operators include the Royal Netherlands Air Force with two DC-10-30CF-based KDC-10 tanker aircraft, the USAF with its 59 KC-10s, and the 10 Tanker Air Carrier with its modified DC-10-10 used for fighting wildfires. Orbis International has used a DC-10 as a flying eye hospital. Surgery is performed on the ground and the operating room is located between the wings for maximum stability. In 2008, Orbis chose to replace its aging DC-10-10 with a DC-10-30 jointly donated by FedEx and United Airlines. The newer DC-10 converted into MD-10 configuration, and began flying as an eye hospital in 2010. One former American Airlines DC-10-10 is operated by the Missile Defense Agency as the Widebody Airborne Sensor Platform (WASP). As of September 2015, the DC-10 had been involved in 55 accidents and incidents, including 32 hull-loss accidents, with 1,261 occupant fatalities. Of these accidents and incidents, it has been involved in nine hijackings resulting in one death and a bombing resulting in 170 occupant fatalities. Despite its poor safety record in the 1970s, which gave it an unfavorable reputation, the DC-10 has proved to be a reliable aircraft with a low overall accident rate as of 1998. The DC-10's initially poor safety record has continuously improved as design flaws were rectified and fleet hours increased. The DC-10's lifetime safety record is comparable to similar second-generation passenger jets as of 2008. The DC-10 was designed with cargo doors that opened outward instead of conventional inward-opening "plug-type" doors. Using outward-opening doors allowed the DC-10's cargo area to be completely filled, since the door was not occupying usable interior space when open. To secure the door against the outward force from the pressurization of the fuselage at high altitudes, outward-opening doors must use heavy locking mechanisms. In the event of a door lock malfunction, there is great potential for explosive decompression. A problem with the outward-opening cargo door first became publicly known on June 12, 1972, when American Airlines Flight 96 lost its aft cargo door shortly after takeoff from Detroit Metro Airport, in flight above Windsor, Ontario. Before Flight 96 took off, an airport employee had forced the door shut. Due to the cargo door's design, the door appeared to be securely locked despite the internal locking mechanism not being fully engaged. Subsequently, when the aircraft reached approximately 11,750 feet (3,580 m) in altitude, the rear cargo door blew out, causing an explosive decompression that created a large pressure differential between the cabin above and the cargo bay below, causing the cabin floor to collapse. This collapsed section of the floor cut or impeded many of the control cables to the empennage control systems necessary to fly the aircraft, which were routed through the floor beams, leaving the pilots with very limited control of the aircraft. The crew performed an emergency landing by using the ailerons, right elevator, some limited rudder trim, and asymmetrical thrust of the wing engines. All 67 passengers evacuated safely. During the investigation of the near-crash of Flight 96, U.S. National Transportation Safety Board (NTSB) investigators found that the DC-10's cargo door design was dangerously flawed. The door relied on a set of heavy steel hooks to secure it against the door frame. When the hooks were fully engaged, an outside lever on the cargo door could be depressed to drive a set of locking pins through the hooks to hold them in place. The NTSB investigation found that it was possible to close the outside lever without the hooks being fully engaged, and there would be no outward signs that the locking mechanism was not engaged; the cargo-door indicator in the cockpit would still register the door as being secured without hooks and locking pins being in the closed position. This combination of factors caused Flight 96 to take off without its aft cargo door being fully locked. Following the Windsor accident investigation, the NTSB made several recommendations, including repairing the faulty cargo door design to make it impossible for baggage handlers to close the cargo door lever without the locking pins being fully engaged. It was also recommended that vents be installed in the cabin floor, so that in case of an explosive decompression, the pressure difference between the cabin and cargo bay could quickly be equalized without collapsing the cabin floor and damaging critical control systems. Although many carriers voluntarily modified the cargo doors, no airworthiness directive was issued to require reworking of the locking system, due to a gentlemen's agreement between the heads of the FAA, John H. Shaffer, and McDonnell Douglas, Jackson McGowen. McDonnell Douglas did make modifications to the cargo door, but the basic design remained unchanged and problems persisted. On March 3, 1974, an almost identical cargo-door blowout caused Turkish Airlines Flight 981 to crash into a forest near the town of Ermenonville, France, shortly after leaving Paris. All 346 people on board were killed; it was one of the deadliest air crashes of all time. Circumstances of this crash were very similar to the previous accident. The cargo door had not been fully locked, though it appeared so to both cockpit crew and ground personnel. The Turkish aircraft had a different seating configuration that made the effects of decompression much more severe, which caused the aircraft's floor to collapse into the cargo bay. Control cables running through the floor beams were severed when the floor collapsed and rendered the aircraft uncontrollable. Crash investigators found that the DC-10's relief vents were not large enough to equalize the pressure between the passenger and cargo compartments during explosive decompression. Following this crash, a special subcommittee of the House of Representatives investigated the cargo-door issue and the FAA's certification of the original design. An airworthiness directive was issued, and all DC-10s underwent mandatory door modifications. The DC-10 experienced no more major incidents related to its cargo door after FAA-approved changes were made. The DC-10 was involved in another deadly crash on May 25, 1979, when American Airlines Flight 191, departing Chicago's O'Hare Airport, went out of control immediately after takeoff. As the airliner rotated during its takeoff roll, the number one (left wing) engine and pylon assembly separated from the wing and swung upward over the top of the wing, severing critical hydraulic lines embedded in the wing's leading edge, as well as tearing away part of the wing structure. The loss of hydraulic pressure to the leading edge slat actuators caused the slats to retract due to aerodynamic forces, increasing the left wing's stall speed above the engine failure climb out speed being used by the pilots. With the left wing stalled and further destabilized by asymmetric thrust, the DC-10 rapidly rolled to the left, sharply descended, and crashed, killing all 271 people on board and two individuals on the ground. The loss of Flight 191 remains the deadliest aviation accident in U.S. history. The crash and its aftermath were widely covered by the media and dealt a severe blow to the DC-10's reputation and sales. Following the crash, the FAA withdrew the DC-10's type certificate on June 6, 1979, which grounded all U.S. DC-10s. It grounded 138 U.S.-registered DC-10s, along with DC-10s from other nations which with bilateral agreements with the United States regarding aircraft certifications, and banned all other DC-10s from U.S. airspace. Even ferry flying within U.S. airspace was forbidden except to allow foreign air carriers to return their DC-10s to overseas maintenance bases. These measures were rescinded five weeks later on July 13, 1979, after modifications were made to the slat actuation and position systems, along with stall warning and power supply changes. The National Transportation Safety Board (NTSB) officials discovered that a maintenance procedure was the cause of the accident. American Airlines mechanics had removed the engine and its pylon as a unit, rather than removing the engine from the pylon, then removing the pylon from the wing, as recommended by McDonnell Douglas. The faulty procedure was done using a forklift, which resulted in inadvertent structural damage. It was subsequently discovered that this short-cut procedure, believed to save many man-hours on maintenance, was being used by three major airlines, although McDonnell Douglas had advised against it. In November 1979, the Federal Aviation Administration (FAA) fined American Airlines $500,000 and Continental Airlines $100,000 for using this incorrect maintenance procedure. The Flight 191 crash highlighted a major deficiency in the DC-10 design: its lack of a locking mechanism to maintain the position of the leading-edge slats in the event of a hydraulic or pneumatic actuation failure. The DC-10's design depended on the principle of hydrostatic lock to keep the slats extended against aerodynamic forces, whereas other aircraft use a positive mechanical system, such as Acme screw actuation, to maintain slat position. It was determined that when the engine and pylon assembly pulled up and over the wing, it severed electrical wiring in the wing, thus rendering vital warning instruments in the cockpit inoperative. Another major DC-10 crash was the United Airlines Flight 232 crash at Sioux City, Iowa, on July 19, 1989. The number two (tail) engine suffered an uncontained fan disk failure in flight, which damaged all three hydraulic systems and rendered the hydraulic flight controls inoperable. The flight crew, led by Captain Al Haynes and assisted by DC-10 flight instructor flying as a passenger (Dennis E. "Denny" Fitch), performed an emergency landing by constantly adjusting the thrust of the remaining two engines. The crew managed to fly the aircraft onto the runway in a partially controlled manner, and 185 of the 296 people on board survived (111 died) despite the destruction of the aircraft during the crash landing. The DC-10 included no cable backup for the hydraulic-powered flight controls because it was considered nearly impossible for three hydraulic systems to fail during one flight, and that the control surfaces were too large to be moved without hydraulic assistance. All three hydraulic systems were in close proximity, directly beneath the tail engine. The #2 engine explosion hurled fragments that ruptured all three lines, resulting in total loss of control to the elevators, ailerons, spoilers, horizontal stabilizer, rudder, flaps and slats. Following the UAL 232 accident, hydraulic fuses were installed in the #3 hydraulic system in the area below the #2 engine on all DC-10 aircraft to ensure that sufficient control capability remained if all three hydraulic system lines should be damaged in the tail area. It is still possible to lose all three hydraulic systems elsewhere. This nearly happened to a cargo airliner in 2002 during takeoff when a main-gear tire exploded in the wheel well. The damage in the left wing area caused total loss of pressure from the #1 and the #2 hydraulic systems. The #3 system was dented but not penetrated. November 3, 1973 – National Airlines Flight 27, a DC-10-10 cruising at 39,000 feet, experienced an uncontained failure of the right (number 3) engine. One cabin window separated from the fuselage after it was struck by debris flung from the exploding engine. The passenger sitting next to that window was killed and ejected from the aircraft. The crew initiated an emergency descent, and landed the aircraft safely. December 17, 1973 - Iberia Airlines Flight 933 crashed and struck the ALS system at Boston Logan International Airport which collapsed the front landing gear. All 168 passengers and crew survived. This is the first hull loss of a DC-10 aircraft. March 1, 1978 – Continental Airlines Flight 603, a DC-10-10, began its take-off from Los Angeles International Airport. Approaching V1 in the takeoff roll, the recapping tread of the No. 2 tire on the left main landing gear separated from the tire and the resulting overload caused that tire to blow out. That in turn, imposed an overload on the No. 1 tire on the same axle, resulting in a second blowout almost immediately after the first blowout. Shrapnel from the rims of the failed tires then damaged the No. 5 tire on the left main gear, causing it to also blow out. The blowouts ruptured a fuel tank, which combined with the excessive heat from the aborted take off maneuver, resulted in a massive fire. Two passengers were killed in the ensuing evacuation and two died later from injuries sustained in the accident. October 31, 1979 – Western Airlines Flight 2605, a DC-10-10, collided with construction equipment after landing on a closed runway at Mexico City International Airport, killing 72 of the 88 people on board and one person on the ground. The crash was caused by failure to follow proper landing guidelines in consideration of the fog on the runway. November 11, 1979 – an Aeromexico DC-10 entered a sustained stall while climbing through 29,800 ft, to its assigned cruise altitude of 31,000 ft, over Luxembourg, Europe. The flight crew failed to monitor their flight instruments, so they did not immediately recognize that the plane was in a stalled condition. Instead, they blamed the heavy buffeting on the #3 engine, which they shut down, while continuing to hold the nose up. The plane continued to descend for one minute in a fully stalled condition, until the pilots lowered the nose and began a proper stall recovery procedure, which was completed at 18,900 ft. The #3 engine was then restarted, the declaration of emergency was canceled and the flight continued to Miami, Florida. Ground inspection revealed four feet missing from each of the outboard elevator tips, including the balance weights. The NTSB concluded that the sustained stall buffeting produced a dynamic structural overload on the elevator, which resulted in the failure of the elevator tips and balance weights. Further, the NTSB concluded that the autopilot had improperly been placed in vertical speed mode. That forced the AP to keep increasing the angle of attack to maintain the preselected vertical speed number, because maximum available engine thrust declined (normally) with increasing altitude. That caused the airspeed to fall below the stall speed of the aircraft. November 28, 1979 – Air New Zealand Flight 901, DC-10-30 ZK-NZP, crashed into Mount Erebus on Ross Island, Antarctica during a sightseeing flight over the continent, killing all 257 on board. The accident was caused by the flight coordinates being altered without the flight crew's knowledge, combined with unique Antarctic weather conditions. January 12, 1981 – Garuda Indonesia DC-10-30 PK-GIB overran the runway on landing at Hasanuddin Airport, Ujung Pandang, Sulawesi, Indonesia and was substantially damaged. January 23, 1982 – World Airways Flight 30, DC-10-30CF registration N113WA, overran the runway at Boston Logan International Airport. All 12 crew survived, but two of the 200 passengers were never found. September 13, 1982 – Spantax Flight 995, DC-10-30CF EC-DEG, was destroyed by fire after an aborted take-off at Málaga, Spain. A total of 50 passengers were killed and 110 injured due to the flames. December 23, 1983 – Korean Air Cargo Flight 084, DC-10-30CF HL7339, was destroyed after colliding head-on with a Piper PA-31 Navajo while taxiing at Anchorage, Alaska. All on board both aircraft survived. February 28, 1984 – Scandinavian Airlines System Flight 901 overran the runway at John F. Kennedy International Airport. The pilot realized that he couldn't stop in time, so he veered the plane off the runway and it rested in shallow water. All 177 people survived the crash. The cause of the crash was the crew's failure to monitor the airspeed during landing. N306FE, the MD-10-30 involved in the attempted hijacking of FedEx Express Flight 705, seen landing at Reno/Tahoe International Airport, 2016. July 27, 1989 – Korean Air Flight 803, DC-10-30 HL7328, crashed short of the runway in bad weather while trying to land at Tripoli, Libya. A total of 75 of the 199 on board plus another 4 people on the ground were killed in the accident. September 19, 1989 – UTA Flight 772, DC-10-30 N54629, crashed in the Ténéré Desert in Niger following an in-flight bomb explosion, claiming the lives of all 170 on board. December 21, 1992 – Martinair Flight 495, DC-10-30CF PH-MBN, crashed while landing in bad weather at Faro, Portugal killing 54 passengers and crew. April 7, 1994 – Federal Express Flight 705, DC-10-30 N306FE, experienced an attempted hijacking. FedEx employee Auburn Calloway tried to hijack the aircraft with the intention of crashing it, but the crew fought him off and returned to Memphis. The co-pilot used a number of aerobatic maneuvers to assist his colleagues in fighting off the hijacker. June 13, 1996 – Garuda Indonesia Flight 865, DC-10-30 PK-GIE, had just taken off from Fukuoka Airport, Japan when a high-pressure blade from engine #3 separated. The aircraft was just a few feet above the runway and the pilot decided to abort the take-off. Consequently, the DC-10 skidded off the runway and came to a halt 1,600 ft (490 m) past it, losing one of its engines and its landing gear. 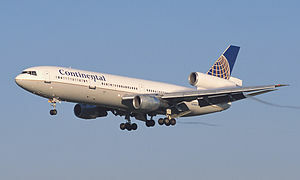 July 25, 2000 - Continental Airlines Flight 55, operated by a DC-10-30 registered as N13067, shed a strip of metal from the thrust reverser cowl door of the number 3 engine, which landed on the runway at Charles de Gaulle Airport upon take off. Minutes later, Air France Flight 4590, operated by a Concorde, ran over the metal strip at near V1 speed, bursting a tire and causing a fuel tank to rupture and burst into flames. The Concorde's pilots attempted to keep control of the aircraft, but it stalled and crashed. The strip of metal was traced to third-party replacement parts not approved by the Federal Aviation Administration. January 31, 2001 – In the 2001 Japan Airlines mid-air incident, a McDonnell-Douglas DC-10-40 and a Boeing 747-446D nearly collided over Yaizu, Japan as a result of incorrect and conflicting instructions by air traffic control. The Boeing 747 had to make an evasive maneuver to pass underneath the DC-10, resulting injuries to 100 passengers in the 747. October 28, 2016 – FedEx Express Flight 910, MD-10-10F N370FE, landing gear collapsed after landing at Fort Lauderdale–Hollywood International Airport. This started a fire that damaged the airplane's port wing. The crew members escaped without injuries. The preserved forward fuselage segment of Monarch Airlines' DC-10-30, G-DMCA,[better source needed] is on display at Manchester Airport Aviation Viewing Park, where it is used for teaching and school visits. DC-10-30 9G-ANB, which previously belonged to Ghana Airways, is on display and in use as the La Tante DC10 Restaurant in Accra, Ghana. DC-10-10 N220AU "Flying Eye Hospital" previously owned by Orbis International was retired in 2016 and is on display at the Pima Air & Space Museum in Tucson, Arizona..
^ a b "DC-10 Family." Archived December 13, 2010, at the Wayback Machine Boeing Commercial Airplanes. Retrieved: January 4, 2011. ^ "Airliner price index". Flight International. August 10, 1972. p. 183. ^ a b "McDonnell Douglas DC-10/KC-10 Transport". Archived March 12, 2006, at the Wayback Machine Boeing. Retrieved: February 28, 2006. ^ Bradsher, Keith (July 20, 1989). "Troubled History of the DC-10 Includes Four Major Crashes". The New York Times. ISSN 0362-4331. Retrieved December 12, 2017. ^ Waddington 2000, pp. 6–18. ^ Endres 1998, p. 13. ^ Endres 1998, p. 16. ^ "American Orders 25 'Airbus' Jets." St. Petersburg Times, September 14, 2011. ^ Endres 1998, pp. 25–26. ^ Endres 1998, p. 28. ^ Endres 1998, p. 52. ^ a b "DC-10 Technical Specifications." Archived February 4, 2007, at the Wayback Machine Boeing. Retrieved: March 12, 2011. ^ Endres 1998, pp. 32–33. ^ Waddington 2000, p. 70. ^ Endres 1998, pp. 34–35. ^ Roach, John and Anthony Eastwood. "Jet Airliner Production List, Volume 2." The Aviation Hobby Shop online, July 2006. Retrieved: September 19, 2010. ^ "Air Progress". Air Progress: 16. September 1971. ^ Steffen 1998, p. 120. ^ Aircraft Value News (November 12, 2018). "Transitioning Product Line Impacts Values of Outgoing Models". ^ Endres 1998, pp. 36–37, 45. ^ Endres 1998, pp. 36, 46–47. ^ a b Steffen 1998, pp. 12, 14–16. ^ Steffen 1998, pp. 12, 118. ^ Endres 1998, pp. 62, 123–124. ^ a b Endres 1998, p. 21, 35, 56. ^ a b Waddington 2000, pp. 70–71. ^ Endres 1998, pp. 57, 112–124. ^ Steffen 1998, pp. 12–13. ^ Endres 1998, pp. 34–37. ^ Steffen 1998, p. 13. ^ Endres 1998, pp. 56–57. ^ Endres 1998, p. 21. ^ Waddington 2000, pp. 137–144. ^ Waddington 2000, p. 89. ^ "DC-10 Twin briefing" (PDF). Flight International. June 7, 1973. ^ Endres 1998, pp. 65–67. ^ "Omega Air Refuelling FAQs." Archived July 28, 2011, at the Wayback Machine Omega Air Refueling. Retrieved: January 11, 2010. ^ "KDC-10 Air Refueling Tanker Aircraft." Archived July 4, 2008, at the Wayback Machine Global Airtanker Service. Retrieved: January 11, 2010. ^ "McDonnell Douglas and Federal Express to Launch MD-10 Program." Archived November 6, 2011, at the Wayback Machine McDonnell Douglas, September 16, 1996. Retrieved: August 6, 2011. ^ "World's First 767-300 Boeing Converted Freighter Goes to ANA." Archived June 22, 2008, at the Wayback Machine Boeing. Retrieved: June 16, 2008. ^ "Northwest Brings Customer Comforts Of Airbus A330 Aircraft To Twin Cities-Honolulu Route." Archived January 30, 2013, at Archive.today Northwest Airlines, January 8, 2007. Retrieved: February 9, 2007. ^ Reed, Ted. "End of an Era at Northwest." Archived July 14, 2006, at the Wayback Machine TheStreet.com, June 30, 2006. Retrieved: February 9, 2007. ^ "Fleet Info". Biman Bangladesh Airlines. Archived from the original on July 19, 2013. ^ a b Richardson, Tom (February 22, 2014). "Remembering the DC-10: End of an era or good riddance?". BBC News Online. Retrieved February 24, 2014. ^ "Last Passenger DC-10 Makes Last Flight?". AVweb, December 6, 2013. ^ "The DC-10 makes its final scheduled passenger flight". USA Today, February 24, 2014. ^ Sarsfield, Kate. "Firefighting DC-10 available to lease." Flight International, March 30, 2009. ^ Kaminski-Morrow, David. 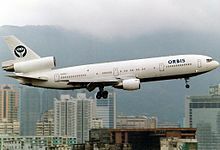 "Orbis to convert ex-United DC-10-30 into new airborne eye hospital." Flight International, April 8, 2008. ^ a b "The ORBIS MD-10 Project." Archived June 13, 2010, at the Wayback Machine orbis.org. Retrieved: September 19, 2010. ^ "ORBIS Flying Eye Hospital Visits Los Angeles to Collaborate with MD-10 Project Supporters." Archived June 13, 2010, at the Wayback Machine Orbis. Retrieved: July 11, 2010. ^ "ORBIS Launches MD-10 Flying Eye Hospital Project." slideshare.net. Retrieved: September 19, 2010. ^ "Space: Widebody Airborne Sensor Platform (WASP)." globalsecurity.org. Retrieved: March 12, 2011. ^ "McDonnell Douglas DC-10 incidents." Aviation-Safety.net, May 10, 2015. Retrieved: May 12, 2015. ^ "McDonnell Douglas DC-10 hull-losses." Aviation-Safety.net, May 10, 2015. Retrieved: May 12, 2015. ^ a b "McDonnell Douglas DC-10 Statistics." Aviation-Safety.net May 10, 2015. Retrieved: May 12, 2015. ^ Hopfinger, Tony. "I Will Survive: Laurence Gonzales: 'Who Lives, Who Dies, and Why'." Anchorage Press, October 23–29, 2003. Retrieved: August 27, 2009. ^ a b Endres 1998, p. 109. ^ "Statistical Summary of Commercial Jet Airplane Accidents (1959–2008)." Boeing. Retrieved: January 11, 2010. ^ Waddington 2000, pp. 85–86. ^ a b c d e f "Behind Closed Doors". Air Crash Investigation, Mayday (TV series). National Geographic Channel, Season 5, Number 2. ^ a b Fielder and Birsch 1992, p. 94. ^ "NTSB-AAR-73-02 Report, Aircraft Accident Report: American Airlines, Inc. McDonnell Douglas DC-10-10, N103AA. Near Windsor, Ontario, Canada. June 12, 1972". National Transportation Safety Board, Washington, DC, February 28, 1973. ^ Waddington 2000, p. 67. ^ Endres 1998, p. 54. ^ a b "Turkish Airlines DC-10, TC-JAV. Report on the accident in the Ermenonville Forest, France on March 3, 1974". UK Air Accidents Investigation Branch (AAIB), February 1976. ^ "Plane crash in France kills 346". St. Petersburg Times, March 4, 1974. Retrieved: May 30, 2012. ^ a b Endres 1998, p. 55. ^ "American Airlines 191". Archived August 13, 2006, at the Wayback Machine airdisaster.com. Retrieved: January 11, 2010. ^ Endres 1998, p. 62. ^ "DC-10 Type Certificate Lifted". awin.aviationweek.com. Retrieved December 11, 2017. ^ a b c d "Aircraft Accident report, DC-10-10, N110A, NTSB, 1979". libraryonline.erau.edu. Retrieved: September 19, 2010. ^ Endres 1998, pp. 63–64. ^ "Flight 191 accident description". Aviation-Safety.net. Retrieved: January 11, 2010. ^ a b "NTSB/AAR-90/06, Aircraft Accident Report United Airlines Flight 232, McDonnell Douglas DC-10-40, Sioux Gateway Airport, Sioux City, Iowa, July 19, 1989" summary, report Archived January 4, 2011, at the Wayback Machine. NTSB, November 1, 1990. ^ "WAS02RA037, NTSB Factual Report". NTSB. ^ "Accident description". Aviation-safety.net. Retrieved January 24, 2017. ^ Swarbrick, Nancy (July 13, 2012). "Air crashes – The 1979 Erebus crash". Te Ara – the Encyclopedia of New Zealand. Retrieved May 24, 2015. ^ "Non-fatal Accidents/Incidents: Scheduled Flights". Flight International: 174. July 18, 1981. ^ "AAR-85-06, World Airways, Inc., Flight 30H, McDonnell Douglas DC-10-30CF, N113WA, Boston-Logan Int'l Airport, Boston, Massachusetts, Jan. 23, 1982 (Revised)" Archived October 4, 2012, at the Wayback Machine. U.S. National Transportation Safety Board, July 10, 1985. ^ "DC-10 accident entry: July 27, 1989." Aviation Safety Network. Retrieved: July 11, 2010. ^ "Crash of a Dutch DC-10 kills 54 at a resort airport in Portugal". New York Times. December 22, 1992. Retrieved February 2, 2017. ^ "Survivors relive horror as 54 die in crash". The Toronto Star. December 22, 1992. Retrieved February 2, 2017 – via Lexus Nexus. ^ "'Poor repair' to DC-10 was cause of Concorde crash". Flight Global. October 24, 2000. Retrieved February 24, 2014. ^ "In pictures: Plane eating in Ghana". BBC. BBC. January 15, 2014. Retrieved July 7, 2017. ^ "DC 10". Pima Air & Space Museum. PimaAir.org. Retrieved July 7, 2017. ^ Gurrola, Adrian (November 22, 2016). "Flying eye hospital makes final stop in Southern Arizona". News 4 Tucson. KVOA.com. Retrieved July 7, 2017. ^ "DC-10 Airplane Characteristics for Airport Planning" (PDF). McDonnell Douglas. May 2011. ^ a b c "Type Certificate Data Sheet A22WE" (PDF). FAA. April 30, 2018. ^ a b "DC-10" (PDF). Boeing. 2007. Endres, Günter. McDonnell Douglas DC-10. St. Paul, Minnesota: MBI Publishing Company, 1998. ISBN 0-7603-0617-6. Fielder, J.H. and D. Birsch. The DC-10 Case: A Study in Applied Ethics, Technology, and Society. Albany, New York: SUNY Press, 1992. ISBN 0-7914-1087-0. "Giant Tri-Jets Are Coming". Popular Science, December 1970, pp. 50–52, 116. ISSN 0161-7370. Steffen, Arthur, A. C. McDonnell Douglas DC-10 and KC-10 Extender. Hinckley, Leicester, UK: Aerofax, 1998. ISBN 1-85780-051-6. Waddington, Terry. McDonnell Douglas DC-10. Miami, Florida: World Transport Press, 2000. ISBN 1-892437-04-X. "World Airliner Census". Flight International, Volume 184, Number 5403, August 13–19, 2013, pp. 40–58. Wikimedia Commons has media related to McDonnell Douglas DC-10. "DC-10 Passenger" (PDF). Boeing. 2007. Robert R. Ropelewski (August 30, 1971). "Dc-10 Minimizes Crew Workload" (PDF). Aviation Week. ‘Simple sophistication’ of aircraft, with improvements in training, credited with reducing flight time for type rating.